The Solar System is the name given to the Sun and its family of planets. This family of planet consists of eight planets and a belt of minor planets or asteroids. They all move in elliptical orbits around the sun due to its force of gravitational attraction. Pluto was considered to be the ninth planet until 2006 when it was reclassified as a dwarf planet. It has an orbit more common with asteroids rather than the other planets and astronomers suspect that it might once have been a moon of Neptune. Astronomers have divided the eight major planets into two groups: terrestrial and Jovian. The terrestrial planets are Mercury, Venus, Earth and Mars and are made up mostly of Iron and silicate rocks and lie closer to the Sun. The Jovian planets are Jupiter, Saturn, Uranus and Neptune and are made up mostly of Hydrogen and Helium. Because of their gaseous composition they are also referred to as the Gas Giants. The Jovian planets are the larger more massive planets with strong magnetic fields and they rotate more rapidly about their axes. Unmanned space probes have shown the Jovian planets have ring systems with moons orbiting them. The sun lies in the centre of the Solar System. It is a yellow dwarf star. It has a surface temperature of approximately 6000°C. Its diameter is about 865,000 miles approximately 109 times the diameter of the Earth. By mass the sun is made up of 71% Hydrogen, 28% Helium and the remaining 1% mass comprising heavier atoms such as Carbon, Nitrogen, Oxygen, Silicon and Iron. 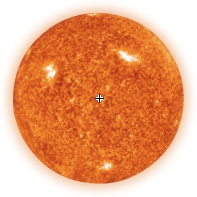 The sun contains 99% of the Solar Systems mass. It has no fixed surface and the temperature is too high for the matter to exist as a solid or a liquid. Due to this different parts of the sun rotate at different rates. 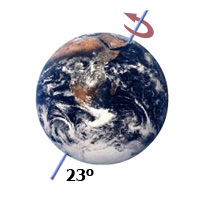 The parts of the surface near the equator complete a rotation in 25 Earth days, whereas the parts near the pole take 36 days. Mercury is the smallest of the eight planets in the solar system. It is the planet with the closet orbit to the sun. Its orbit lies between the sun and the orbit of Venus and it has no known moons. 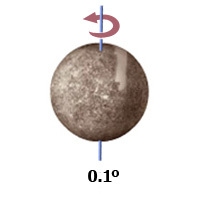 Mercury has a diameter of approximately 3000 miles. It is made up of a high percentage of metal making it the densest planet in the solar system. It takes Mercury 88 Earth days to orbit the sun. 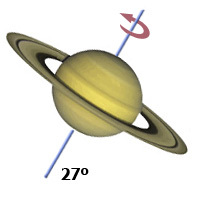 The fast orbit is offset by the planets slow spin. It takes Mercury 59 Earth days to complete one rotation about its axis. Venus is the second planet from the sun. Its orbit lies between the orbits of Mercury and Earth and has no known moons. It is the closest planet to the Earth and after the moon is the most brilliant natural object in the night sky. Venus has a diameter of approximately 12,100 km making it slightly smaller than Earth (Earth’s diameter is approximately 12,750 km). Although further away from the sun than Mercury, Venus is the hottest planet in the solar system. This is because it has a very large atmosphere made up mostly of Carbon Dioxide. This thick, dense atmosphere traps the heat radiated from the planet’s surface and the sun (greenhouse effect) making the average temperature on Venus about 460°Celsius. Venus spins about its axis very slowly taking 243 Earth days to complete one rotation, which is the length of a day on Venus. It completes one orbital revolution of the sun in 225 Earth days making Venus the only planet where a day is longer than a year. 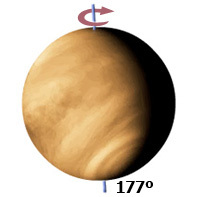 Venus rotates about its axis in a retrograde motion i.e. in a direction opposite to the other planets. Venus and Neptune are the only planets which rotate counter clockwise while the other 6 planets rotate clockwise. Earth is the third planet from the sun. It is the only planet that hosts all known life. Its orbit lies between Venus and Mars and has one moon. The Earth has a diameter at the equator of 12,756km. It spins about its axis once every 24 hours (1 Earth day) and takes 365.256 days to orbit the sun. The Earth’s atmosphere is made up of 78% Nitrogen, 21% Oxygen and the remaining 1% consists of other gases such as Argon, Carbon Dioxide, Methane and Hydrogen. Mars is the fourth planet from the sun. The orbit of Mars lies between Earth’s orbit and Jupiter’s orbit. Between Mars and Jupiter lies the main asteroid belt. Mars has two small moons called Phobos and Deimos. Mars is the second smallest planet in the solar system. Its diameter at the equator is approximately 6,800km. 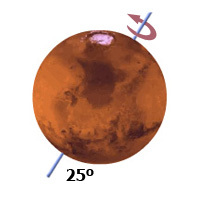 It takes Mars 687 days to complete one revolution of the sun. Thus, one year on Mars is equivalent to almost 2 Earth years. Mars is called the red planet due to the reddish brown Iron Oxide on its surface. Its atmosphere is made up mostly of Carbon Dioxide, however the atmosphere is very thin making the average temperature on the surface average about -70°Celsius. 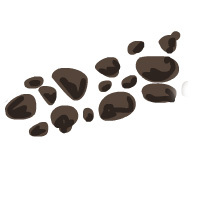 Asteroids are chunks of metal and rock much smaller than the planets that orbit the sun. Most of the asteroids in the solar system are found in the asteroid belt a region between the orbits of Mars and Jupiter. It is considered by astronomers that during the formation of the solar system the immense gravitational pull from Jupiter prevented the asteroids from joining together to form a planet. Jupiter is the fifth planet from the sun. It is the largest planet in the solar system with a diameter at the equator of approximately 143000km. More than 1300 Earths can fit inside Jupiter. Jupiter holds more matter than all the other planets in the solar system. Its strong gravitational pull is accountable for the many moons that orbit the planet. To date more than 60 known moons orbit Jupiter. It completes one rotation in 9hours 55 minutes, which is the length of a day on Jupiter. It takes about 11.9 earth years to orbit the sun. 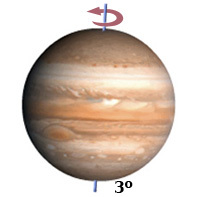 Jupiter has no solid surface. It is composed mainly of Hydrogen and Helium. The large pressures in the planets interior account for Hydrogen and Helium in the liquid form surrounded by a gaseous atmosphere. The Great Red Spot is a huge oval shape storm system in the planets southern hemisphere. Saturn is the sixth planet from the sun. After Jupiter it is the second largest planet in the solar system. Its diameter at the equator is approximately 75000 miles (120,500 km). Saturn’s orbit lies between Jupiter and Uranus and it takes about 30 Earth years to complete one revolution around the sun. It rotates about its axis in 10.8 hours, which is the length of a day on Saturn. Saturn like Jupiter is one of the gas giants and is composed mostly of Hydrogen and some Helium. Saturn’s most famous feature is its ring system. This is made up of hundreds of thousands of individual rings held in orbit by the pull of Saturn’s gravity. The rings are made up of countless ice chunks and dust particles. In addition to the ring system there are more than 50 known moons that orbit Saturn. Uranus is the seventh planet from the sun. Its diameter at the equator is about 32000 miles (51500 km) making it the third largest planet in the solar system. It takes Uranus 84 Earth days to complete one trip around the sun. 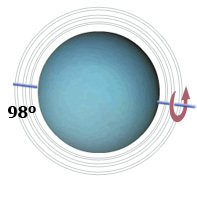 Uranus completes one rotation on its axis in approximately 17 Earth hours, which is a length of a day on Uranus. Uranus is different to the other planets in that its rotation axis lies nearly to its side as it goes around the sun. Like Venus it rotates about its axis in a retrograde motion. Scientists think that this alignment may have been caused by violent collisions with other bodies early in its history. Uranus has a liquid interior due to very high temperatures and pressures inside the planet. It is made up of the melted ices of water, methane and ammonia, along with molten rock and metals and small amounts of Hydrogen and Helium. Uranus has a massive atmosphere made up of approximately 75% Hydrogen and 25% Helium with small amounts of methane, water and ammonia. Uranus has a system of about 12 narrow rings; the rings are made up of countless particles orbiting the planet. Uranus has 5 major moons and more than 20 smaller ones. Neptune is the eight and farthest most planet from the sun and cannot been seen by the unaided eye. It has a diameter of approximately 31000 miles (50000 km). It takes Neptune 146 Earth years to orbit the sun. 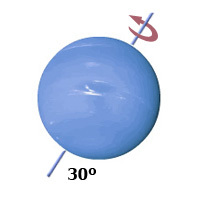 Neptune takes 16 hours to complete one rotation about its axis, which is a length of a day on Neptune. Like the other gas giants Neptune has a massive atmosphere made mostly of Hydrogen with some Helium and about 2% of Methane. It is the Methane in Neptune’s atmosphere that makes it appear bluish in colour. The interior is similar to Uranus being made up of melted ices of water, Methane and Ammonia, along with molten rocks and metals. Neptune has 6 narrow rings composed of dust size particles orbiting the planet. Neptune has 13 known moons. Pluto was discovered in 1930 and was considered the ninth planet of the solar system up until 2006 when it was classified as a dwarf planet. This was due to many other objects of a similar size to Pluto being discovered in a region where it lies called the Kuiper belt. So, rather increase the number of planets each time a new object was discovered the definition of planets was redefined to exclude objects such as Pluto and a new category called dwarf planets was designated for Pluto. Pluto has a diameter of about 1500 miles (2400 km). It takes Pluto 248 years to complete a trip around the sun, which is the length of a year on Pluto. It completes one rotation about its axis in 6.4 Earth days. Its atmosphere is composed of Nitrogen with small amounts of Methane and Carbon Monoxide. Its ineterior is thought to be made of rock and ice. 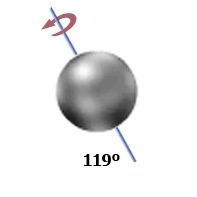 Because of its great distance from the sun the surface temperature on Pluto is extremely cold. Pluto has one known moon.